NEW YORK -- A 100-pound mattress salesman from Saitama, Japan, known as "The Rabbit" set a new world's record Tuesday by eating more than 25 hot dogs in just 12 minutes at Nathan's annual Independence Day hot dog-eating contest in Coney Island. Kazutoyo Arai consumed an unprecedented 25 and one-eighth hot dogs, defeating his massive American challenger, reigning hot dog champ Steve "The Terminator" Keiner, 35, of Atlantic City, New Jersey. At 391 pounds, Keiner won the contest last year by downing 21-plus hot dogs in 12 minutes, but came in this year at the middle of the pack by only eating 15 wieners and buns. The contest also saw the first woman to place in one of the top three spots. Takako Akasaka, also of Japan, finished third by eating 23 hot dogs. 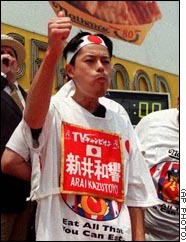 Japanese native Milisao Fujita finished second by downing 24 hot dogs, marking the first time in contest history that all three top spots were won by Japanese citizens. The 5-foot-6-inch Arai weighed in at 100 pounds. He topped the previous record of 24.5 hot dogs set in 1997 by another native of Japan, Hirofumi Nakajima. Nathan's contest has been held at the original Coney Island hot dog stand every Independence Day since 1916, the year Nathan Handwerker borrowed $320 from entertainers Eddie Cantor and Jimmy Durante to start the business. The contest winner gets to wear the bejeweled Mustard Yellow International Belt until next year. The National Hot Dog Council estimates Americans will eat 88 million hot dogs Tuesday at Independence Day Celebrations.